Unfortunately, Catastrophic History fell into the category of novels which had been hyped up to such a point that I could only find them disappointing. While there were many aspects of this story I enjoyed and admired, I feel as if overall, this may be targeted to a younger or, at any rate, less-well-read audience. For me, the plot line of dying and returning as a ghost or contemplating your life from heaven has been vastly overdone and Catastrophic History didn't bring anything new to the mix. Bria dies of heartbreak. Yes, literal heartbreak for when her boyfriend claims he doesn't love her, her heart shatters cleanly in half, resulting in her immediate death. Now, Bria must go through the five stages of grief, all with the help of Patrick, a lost soul who seems to have taken an unwarranted amount of interest in her. Yet, Bria doesn't want to accept her position in life - or heaven actually - she wants revenge. Bria, I have to admit, is one of the most realistic characters I've come across in literature. While I found her narration to be rather silly and her actions even sillier, I am forced to conclude that they are perfectly in line with teenagers of our age, which I truly appreciate. Furthermore, the plot-line of this novel moves at a decent pace and constantly throws curveballs at you when you least expect it. I loved how many unexpected plot twists were present in this story and seeing their impact on Bria, along with the misunderstandings they brought, was a lot of fun. Yet, for all my adoration of Bria, I am quite unable to figure out why she never questioned Patricks' presence in her life. I feel as if it was something I would definitely do and I was doing as the novel progressed and the truth emerged. Patrick is...well, he's cheesy. I liked him a lot as a person, but I thought the truth surrounding his past was rather unrealistic and his dialogue was filled with cheesy lines (literally!) and cliches, so it took some getting used to. Overall though, he was an enjoyable romantic interest. 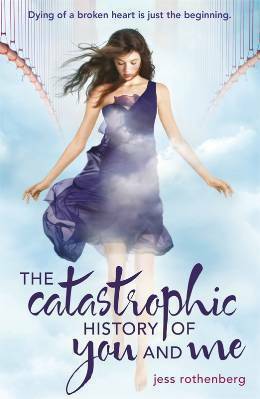 While Catastrophic History evidently has many positives, I was vastly disappointed by the manner in which the ending was so easily wrapped up. Plus, I found the rather random sub-plot of reincarnation thrown at the end to be jarring, sudden, and strange. While it made sense to the story, I feel as if it interrupted the flow and made an otherwise well-developed tale need more detail. In addition, the romance was also very sudden. I think one of the reasons I loved Laini Taylor's Daughter of Smoke and Bone was because, despite being an insta-love story with reincarnation of sorts, it still was a developed tale that drew me in. Brian and Patricks' romance did nothing of that sort and by the end of this story, I felt cheated of a truly spectacular ending. The Catastrophic History of You and Me is a far more serious novel than originally believed, but it is merely an enjoyable one. It is a quick read, a lovely time-pass, and yet another interesting venture into heaven. Furthermore, its realistic teenage voice will grab you from the start and while it proved catastrophic for me, perhaps the ending will work much better for you. Thus, I'd definitely recommend this one and can say for sure that many readers will whole-heartedly enjoy it. She dies of heartbreak, really? I am not sure if I want to read this book or not. Thanks for stopping by! Dying of a broken heart is a little unbelievable but I still might pick this up. I haven't really decided yet. My TBR list is so huge that I'm sure I won't be reading this any time soon. Sorry you didn't love this, hun! I have it on my shelf to read but I don't have time right now. I am really happy to hear that Bria is very realistic, I like that! Oh, that is just too bad! I remember liking this a lot at the time. Althouhg I'm ready to admit it has problems, and I totally agree with you on the reincarnation issue, I was still pleasantly surprised by it. I guess it all depends on the characters for me, and I felt the same as you did about Bria. Thanks for the review. I admit -I’ve been seeing this cover everywhere and it pulls me in. I may still try this one.